Rumah Sakit Umum Pusat Dr Sardjito Yogyakarta - RSUP Dr Sardjito is a leading government-owned general hospital based in Province of Special Region of Yogyakarta (DI Yogyakarta). RSUP Dr Sardjito is registered at Jl Kesehatan Sekip Sleman Yogyakarta. 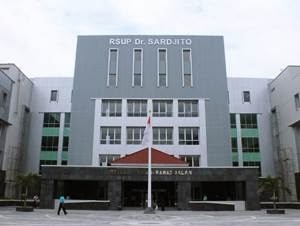 RSUP Dr Sardjito was established in 1982 and is fully-owned by the Government of Indonesia. RSUP Dr Sardjito operates directly under the Ministry of Health Republic Indonesia through Directorate General of Health Efforts. According to information found in RSUP Dr Sardjito's website as cited by JobsCDC.com, RSUP Dr Sardjito is a hospital type A, that means in addition to health care but also the teaching hospital. RSUP Dr Sardjito is a reference hospital in DI Yogyakarta and Southern part of Central Java regions. RSUP Dr Sardjito now has 813 beds, including 16 Suite Rooms, 28 VVIP A, 2 VVIP B, 9 VIP B, 42 VIP, 6 main class, 67 class I, 340 class II, and 303 class III. RSUP Dr Sardjito directly employs nearly 3,015 staff. D3/S1 in the field of Information Technology, Electro or Telecommunication. Minimum age of 18 years and maximum age of 30 years old for D4/S1/S2 and maximum age of 28 years old for D3 on 1 March 2018. Minimum GPA of 3.00 for PTN and 3.20 for PTS. Have minimum TOEFL score of 425 for D4/S1/S2 and 400 for D3, published starting 1 February 2018. Well behaved and never sentenced to imprisonment or confinement proved by SKCK. Unbound and / or not being an employee of any institution and not attending formal / non formal education. Minimum height of 155 cm for Female and 160 cm for Male. Have an ideal/proportional weight and good looking. Willing to be a contract employee non CPNS RSUP Dr Sardjito and do not demand to become CPNS / PNS. JobsCDC.com now available on android device. Download now on Google Play here. Please be aware of recruitment fraud. The entire stage of this selection process is free of charge. RSUP Dr Sardjito - Contract Staff Non CPNS RSUP Dr Sardjito February 2018 will never ask for fees or upfront payments for any purposes during the recruitment process such as transportation and accommodation.